Installs in under a minute and includes drawings (in PDF and/or CAD), specification sheets and sample installations. Windows users click here to download your architects manual. Mac users please click here for your Zip file dowload. The only legal compliance requirement in Australia for an automatic door is the BCA or NCC. All automatic sliding door operators manufactured by Rubek Automatic Doors fully complies to all relevant sections of the BCA. Always have and always will. In fact we exceed safety requirements. The Australian Standards that refer to automatic doors are AS5007 and AS1428. AS1428 is a mandator Standard referenced in the BCA that deals with door clearance and openings with regard to disabled access. Rubek always assists to make sure designs meet these minimum requirements. AS5007 is a guideline and not a mandatory Standard as it is not referenced in the BCA or legislation. Rubek manufactures automatic sliding door operators that exceed the safety, endurance and power fail requirements of AS5007. Rubek sliding door operators all comply fully to the fire code. DIN18650 is included here to raise awareness of its irrelevance in Australia's market. This is the adopted European Standard for automatic doors and would appear to be the basis AS5007 was created from, as opposed to what we believe are just claims that AS5007 is solely the amalgamation of AS4085 and AS4290. Important to note that in Europe DIN18650 is compulsory and in Australia AS5007 is not. As compulsory requirements in their own countries the main difference between the DIN18650 and Australia's BCA however is that door operators that are imported into Australia, usually from Europe or China, with a DIN18650 compliance certificate are highly likely to not pass our BCA particularly Section D2.19(b)(iv)(A) for 110N of manual force. This is because in Europe they allow up to 150N of force. The reason for this is that in Australia we typically have bigger heavier doors whilst door operators designed in Europe and China are built to drive small light doors and therefore are in themselves small and lightweight with very small housings. Small housings always mean smaller internal parts including smaller motors which have to be highly geared, the result of which is that the doors cannot possible be manually moved with 110N of force as our BCA calls for. The same technical problems apply to sliding door operators built in Australia that are also small or lightweight, forcing the use of small highly geared drive systems that may also not comply with the BCA. And, as we have already mentioned above, no NATA Laboratory in Australia conducts any BCA or AS5007 safety testing whatsoever; meaning you have no idea if it complies to the BCA or not. When an automatic door is installed, acording to the Building Commission, the responsibility of BCA compliance and safety falls with the local shire council office. Trouble is the local council only tests to make sure the doors open on a fire signal when doing a fire test and its the fire testing company that actually does that test. The local council officials do no other testing and in our experience, don't know how to. which all aids greatly some manufacturers and service companys in misleading architects, specifiers, builders, fabricators and end users by twisting the BCA and AS5007 wording to suit their own design and sales agendas to the detriment of end user safety. The only way any specifier or buildng owner can safeguard themselves and can be assured that they have an automatic door that is safe and complies with the BCA is by getting it in writing from the manufacturer before purchase (at specification stage) and after commissioning in the form of a manufacturers compliance certificate. Rubek will always be compliant and will always issue a full compliance certificate. The Building Code of Australia (BCA) is Volumes One and Two of the National Construction Code (NCC). The BCA is produced and maintained by the Australian Building Codes Board (ABCB) on behalf of the Australian Government and State and Territory Governments. The BCA has been given the status of building regulation by all States and Territories. there is no regulatory or non-regulatory alternative that would generate higher net benefits. The BCA contains technical provisions for the design and construction of buildings and other structures, covering such matters as structure, fire resistance, access and egress, services and equipment, and energy efficiency as well as certain aspects of health and amenity. The BCA is the ONLY legal entity that an automatic door must comply with which includes any relevant Australian Standards referenced from within it. The BCA (Building Code of Australia) is still the ONLY legal requirement that ALL automatic doors must fully comply with and that includes Section D2.19(b)(iv)(A) below that states a door “must be able to be opened manually under a force of not more than 110 N if there is a malfunction or failure of the power source”. It is NOT acceptable for a door to be driven open in the event of a malfunction. AND the term malfunction applies to the whole operator and not just the power supply as some companies portray it. (B) if it leads directly to a road or open space it must open automatically if there is a power failure to the door or on the activation of a fire or smoke alarm anywhere in the fire compartment served by the door. (B) the door is not required to be a fire door or smoke door. (iii) where a two-leaf door is fitted, the provisions of (i) and (ii) need only apply to one door leaf if the appropriate requirements of D1.6 are satisfied by the opening of that one leaf. Proposes requirements for the design, and test methods for, drive units, leaves and components of powered pedestrian doors, including constructions that are operated electro-mechanically, electro-hydraulically or pneumatically. This Standard sets out the requirements for design and test methods for drive units, leaves and components of powered pedestrian doors. Such door constructions may be operated electro-mechanically, electro-hydraulically or pneumatically. This Standard also provides requirements for design of the installation, verification/testing, marking and commissioning of the complete powered pedestrian door installation. (a) Powered doors where the door leaves move vertically. (b) Powered doors mainly intended for vehicular traffic or access for goods. (c) Powered pedestrian gates or barriers. (e) Powered doors used on lifts. (f) Power operated in environments where there is risk of explosion. This Standard applies to all powered pedestrian doors used in all types of buildings as classified in the BCA and other building legislation as appropriate. Doors can be of sliding, folding, swing and revolving type with a horizontally moved leaf. Powered pedestrian doors can be used in all types of entrances including escape or rescue routes and emergency exits, as well as on smoke and fire doors. Powered pedestrian doors with specific security needs to override the requirements of this Standard. Refer to Clause 3.3.4 for specialized operations. Compliance with this Standard does not in any way preclude the use of any alternative solution which can be shown to satisfy the requirements. IMPORTANT NOTE : Contrary to the implication made above in Paragraph 1 of Application (from Section 1.2 of same Standard), this Standard is NOT referenced in Legislation or the BCA and is therefore deemed a guideline and NOT a mandatory requiremment for any automatic door in Australia. At present there is NO NATA accredited test laboratory in Australia set up to test and certify to the full scope of AS5007-2007. Therefore FULL NATA certification to AS5007-2007 is not possible and does NOT EXIST. Exova Warringtonfire in Victoria and ALS Global in Queensland and Victoria are the only NATA laboratorys with partial accreditation to test a small part of AS5007-2007. This partial testing is for Sections 4.4.1 Endurance and 4.4.2 Power Fail. To date they CANNOT and DO NOT conduct any testing for safety (Section 4.4.3, Table 4.1) which is most (~85%) of the standard and we believe is the most important part. 4.6 Verification of Compliance – All powered pedestrian door operators shall be subject to a type test by a NATA recognised testing authority, verifying compliance with this standard. Rubek Automatic Doors accepts and believes in the spirit in which the standard is written and can state that all current Rubek automatic door operators fully comply or exceed all relevant sections of the standard with the only exception being section 4.6 (see above) relating to full NATA compliance testing for the reason above. FULL CERTIFICATION IS NOT POSSIBLE AS THERE IS NO LAB SET UP TO DO IT. There is presently NO automatic sliding door operator in Australia tested as fully compliant with FULL certification to AS5007-2007. After 8 years AS5007-2007 is still not referred to in Government legislation or building code regulations and is therefore a guideline and NOT a legal requirement. Any automatic door company reporting to have FULL compliance certificates for AS5007-2007 we would recommend highly that you gain copies of these certificates and verify their content. Sets out minimum design requirements for new building work, as required by the Building Code of Australia (BCA), to enable access for people with disabilities. It covers aspects of access to and within a building. This publication is available in our OnTheGo format. NOTE: The BCA and Premises Standards set out requirements for other features of the accessible built environment not covered in this Standard, such as lifts, hearing augmentation, tactile ground surface indicators, signage, glazing, lighting, car parking and toilet numbers, and distribution. This Standard is referenced by the BCA and the Premises Standards for the provision of access for people with disabilities. As a BCA and Premises Standards referenced document, it is applicable to buildings as and when specified in the BCA and Premises Standards. NOTE: Compliance with this Standard may also be required by other regulatory authorities. This Standard provides the technical detail required to achieve the level of access for a deemed-to-satisfy solution. The requirements specified in this Standard are intended to permit general use of buildings and facilities by people with disabilities acting independently, or where a person’s usual method of operation is with an assistant, in the company of that assistant. NOTE: The Standard is based on data resulting from empirical testing of persons aged between 18 and 60 years and may not be appropriate when applied to persons outside this age range. (a) On an accessway, at the location of a turn greater than 60°. (b) New accessible sanitary facilities. (c) At doorways, including door width and circulation space. This standard specifies requirements for the design of, and the relevant test methods for, drive systems, door leaves and fittings of powered pedestrian doors. Powered pedestrian doors may be operated electro-mechanically, electro-hydraulically or pneumatically. This standard covers powered pedestrian doors used in escape routes, as fire-resisting and/or smoke control doors and those for all other applications. The types of door dealt with here include powered pedestrian sliding, swing, revolving, sliding swing (balanced) doors and powered pedestrian folding doors with horizontally moving leaves. This standard does not apply to powered room partitions, powered doors with vertically moving door leaves, powered doors mainly intended for vehicular traffic or access for goods, powered doors within industrial premises, powered pedestrian gates or barriers, powered pedestrian turnstiles, powered lift doors, or doors operating in environments where there is a risk of explosion. These new regulations cover safety in use of power operated pedestrian door sets used for normal access, in escape routes and as fire resistance and/or smoke control door sets. Power operated pedestrian doors including sliding, swing, revolving door sets, balanced and folding door sets with a horizontally moving leaf, hence forward need to comply to the EN 16005 as well as already existing legislation. Starting April 10th, 2013, all new installations must comply with the EN 16005. However, this does not apply to power operated door sets put in use before the official CEN document was published on October 10th 2012. The EN 16005 forms a workable bridging document between the existing requirements of DIN18650, Risk Assessmant from BS7036:1996 and the European Machinery Directive in that it compels manufactures to produce safer products and enables installers to provide safer completed installations. © 2019. 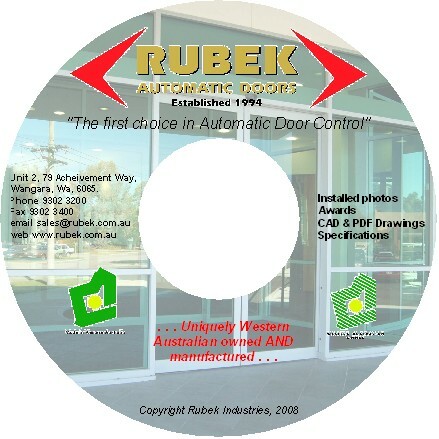 Rubek Automatic Doors. All Rights Reserved.